Is after sun skin care part of your routine? Even if you don’t have a sunburn, after sun skin care is a summer necessity tore-hydrate and soothe sun-kissed skin. Cleanse Away Impurities - After a long day spent outdoors, your skin could likely use a good cleanse. Often, sunscreens mixed with the unavoidable summer sweat can leave your skin feeling less than pristine. But fear not! Cleansing helps remove any unwanted dirt, oil, and impurities on your skin’s surface. The result? Skin that looks (and feels) clean and comfortable! So go ahead and lather up with your favorite facial cleanser. Be sure to extend the cleansing love to your body skin while showering as well. Give Back to Your Lips - Wearing a lip conditioner formulated with SPF when you’re out in the sun is a no brainer, but with so many other things going on it’s easy to forget to reapply. The result? Lips that look (and feel) worse for wear. If your lips are craving some moisture, the two steps you should take are exfoliating and hydrating—in that order. Start off your post-sun lip care routine with a lip scrub that can help buff away dead cells from skin’s surface, follow up with a hydrating lip conditioner. 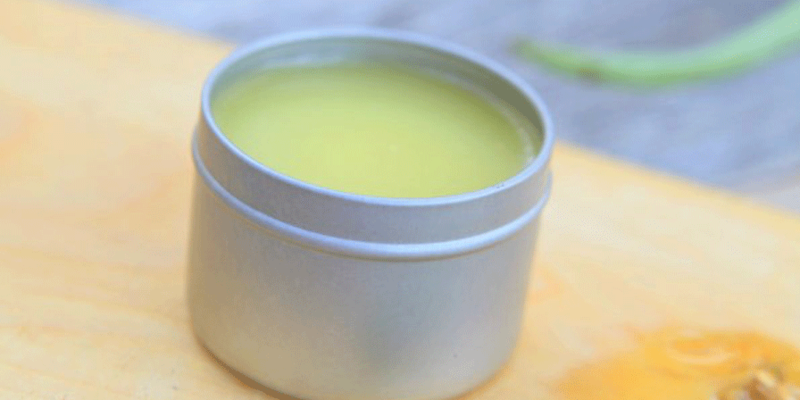 This after-sun salve recipe is a summer necessity to re-hydrate and soothe sun-kissed skin. Apply it after a good scrub in the shower to remove sunscreen residue. Slather on this balm and your skin will drink in the oils and butters, dealing with sun-damaged skin while you sleep. Makes 2 oz. Make it - Melt the oils, butters, and beeswax in a double boiler or Turkish coffee pot. Use a medium heat and stir as the oils melt. Remove from heat just as all ingredients are liquid. Stir in essential oil. Allow to cool slightly and then add the aloe gel. Mix the gel in well with the rest and pour into a 2 oz container.